Finally we are leaving Chiang Mai. As Anne alluded to in her last post, we have many thoughts and questions swirling in our minds, being back on the road after so much down time will be enjoyable and clear our heads. I think that some of my lethargy this last 10 days has been the anti climax of reaching Thailand. The first class roads, first world facilities and the lack of challenges that we have faced along the road so far have taken the edge off the journey. When you have an objective, you focus on achieving it, when it’s done, the question is what’s next. I remember when we travelled through Africa in 1982/83 and reached the Cape of Good Hope, south of Cape Town, there was satisfaction at the achievement, a let down that it was over but then, ok what’s next? It is about the journey not the destination and so we set new goals and objectives after a short reflection time and off we go again. Our departure from Liam’s Guest House and our hosts Ron and Daphne was hard after the hospitality and helpfulness they had shown during our stay. As we had to keep extending our stay each day while waiting for Anne’s BMW part to arrive, I am not sure they thought we would ever leave! It was a great place to stay, a quiet oasis outside the city of Chiang Mai. We will miss this place and the people, but the road beckons. 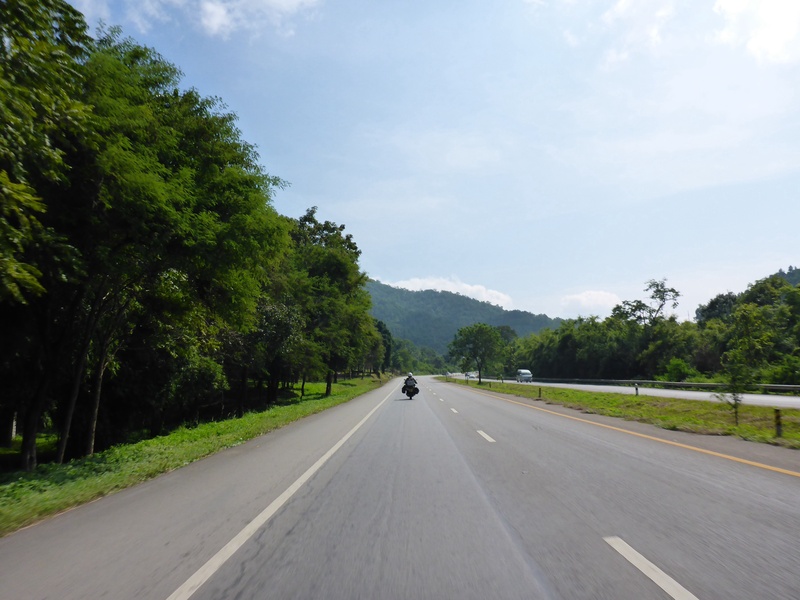 The roads in the north of Thailand, we have been told, are great for motorcycling by the various expats living here that we met. We have had so many suggestions of routes and contradictory views as to the roads condition, it has been difficult to chose. We have decided to head today to Nan about 300 km east by road from our current location. We retrace our route for about 100km then head east riding on good surfaces with gentle bends. 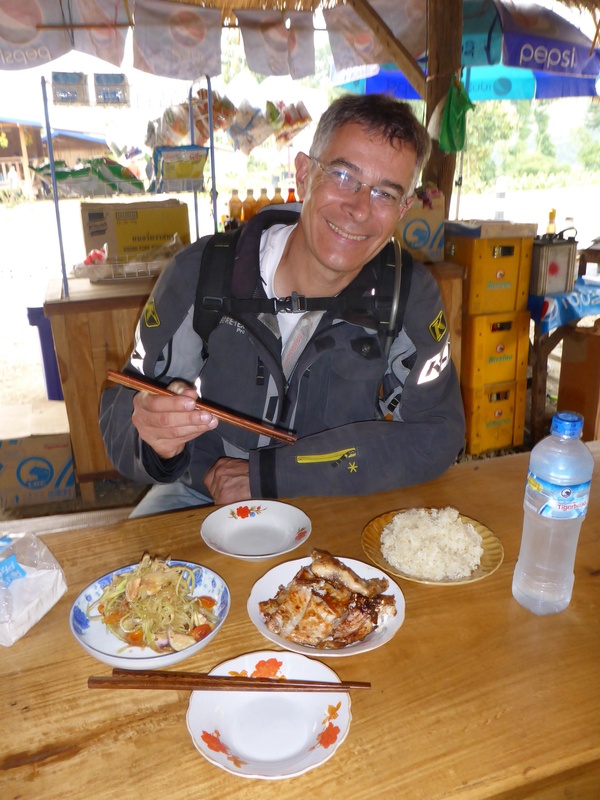 A recipe for good motorcycle riding. 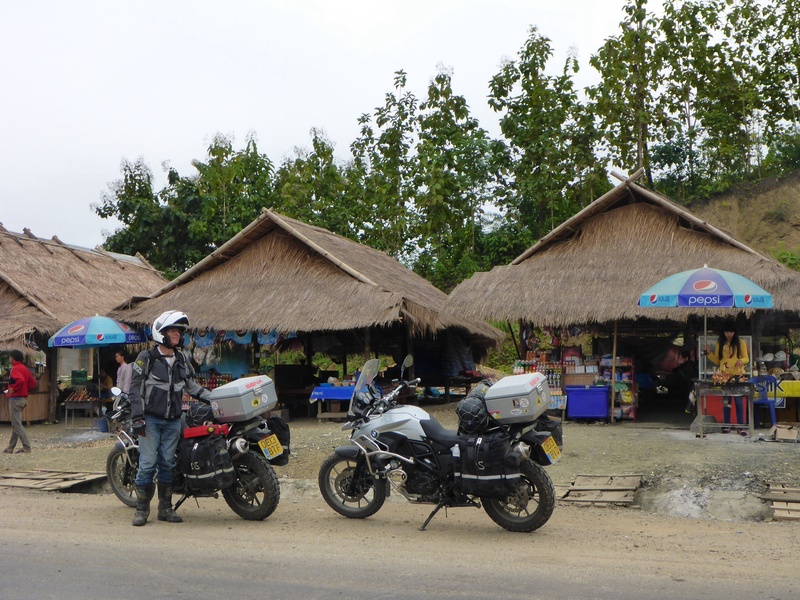 The smell of food as we pass a roadside cafe has us turn around for lunch. We sit in comfortable chairs watching the occasional traffic go by as we have an excellent fish dish and a rather hot salad. Total cost about $2.50, €2.00 or £1.80. Thailand food prices are so reasonable I could not imagine anyone, expats that is, living here cooking their own meals apart from breakfast. I have noticed the leaves of some trees are turning from green to yellow, and the current rice harvest seems to be almost completed. The air is cooler and the landscape has an autumn dryness about it with brown stalks and stubble predominating the farming areas. 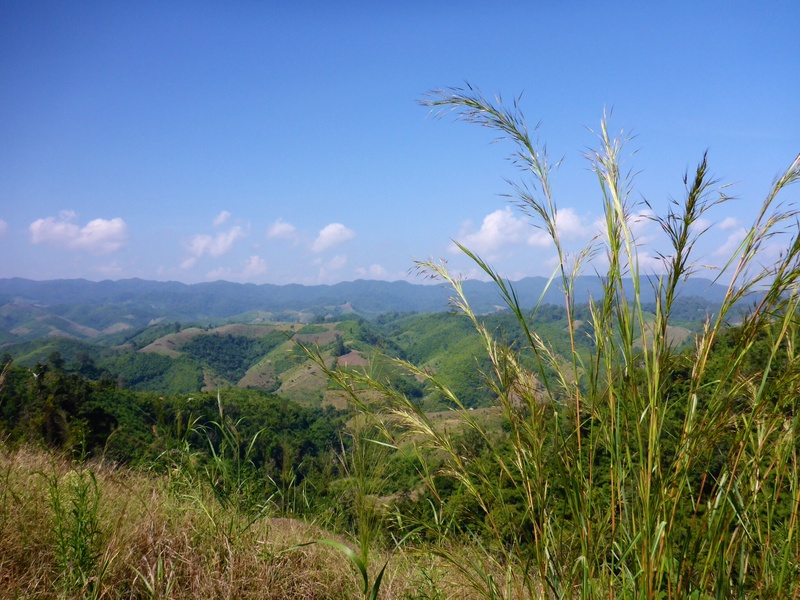 This land is well utilised with rice grown on flat land and corn / maize / mealies on quite hilly ground. Occasionally, we pass small groups working diligently in the fields harvesting rice. One thing we do notice is that most of them have arrived by car or moped which are parked neatly at the side of the road. 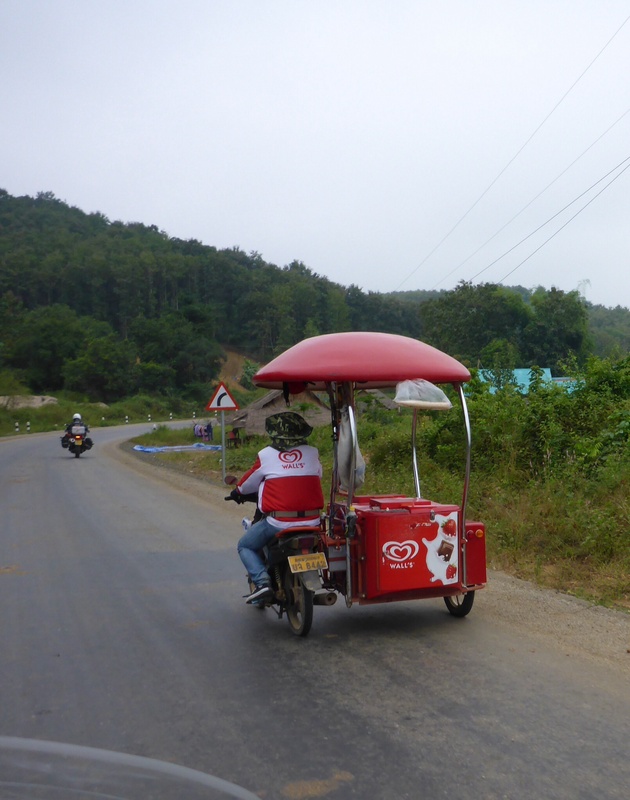 A sign that prosperity is reaching into the countryside and is not just confined to the towns. Butterflies abound, white, yellow and darker, multi coloured varieties. I watch then as I ride, hoping as they flit into my field of vision that they will not become casualties of my motorbike’s passage; thankfully most pass unharmed. I really enjoy their presence and it reminds me how few I see in Australia. 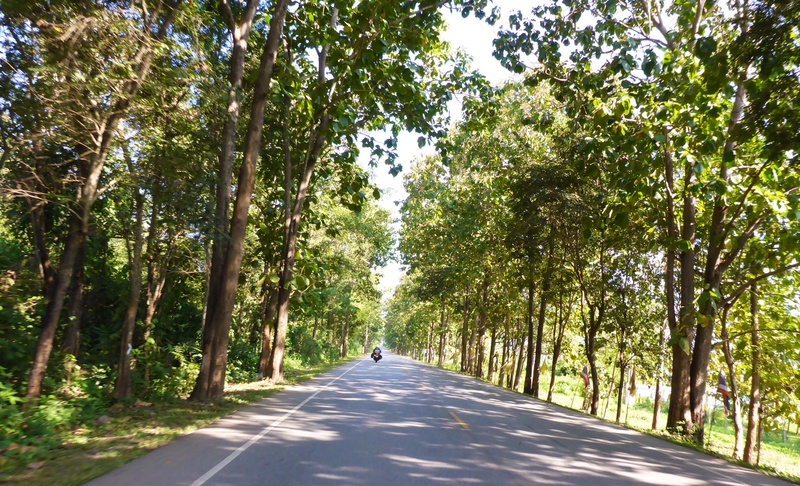 In places, the road is lined with teak trees, tall and imposing with huge leaves which we have been warned are an early morning hazard on the road – covered in dew they are very slippery! We arrive in Nan and make our way to a nice hotel that Anne had identified previously near the river. We ask ‘do you have a room for tonight?’ They do not, but ring around hotels to find a room for us, then as they talk to the second hotel, we realise that they understood our question to be ‘do you have a room for two nights?’ We have our room and a reminder to think when we phrase questions as they may be misinterpreted. A stroll along the river for a great whole fish dinner completes our first riding day in almost 2 weeks. It’s good to be back on the road. At a fuel stop early next morning, I see a Chelsea, the soccer club I support, shirt. He speaks no English but is knowledgeable about not only Chelsea, but Southampton’s position of second place in the English Premier League despite having sold many leading players at the end of last season. There is no language barrier in football and it interesting to see that the Chelsea website has Thai as one of the half dozen Asian languages they support. Asian supporters of English football are big business. 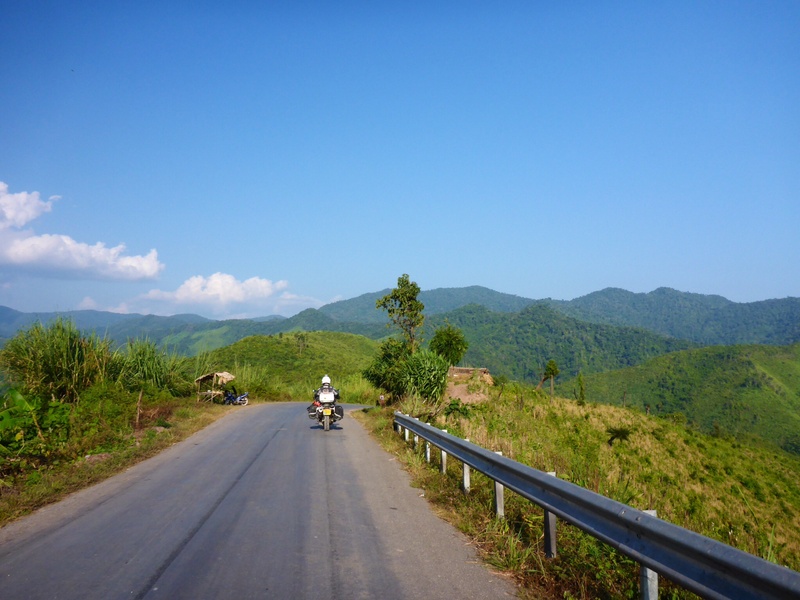 The border is only 100km from Nan and a good road, we climb higher and start to run along the ridges of the mountains. 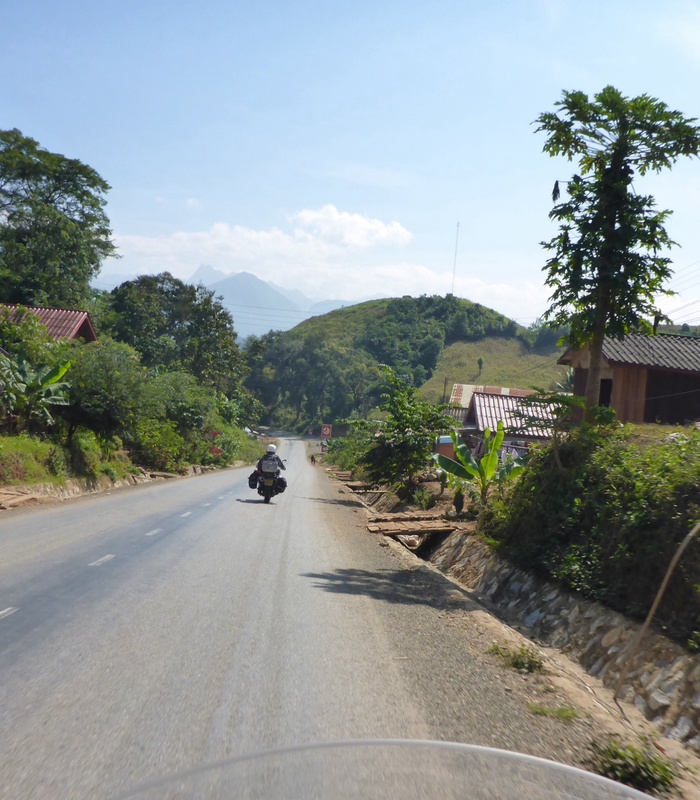 It’s glorious, superb vistas unfold before our eyes as the road swings right and left up and down, no traffic and a great road as this was upgraded to support construction of a lignite power station over the border in Laos. There is little traffic and few turn offs which makes me wonder how locals travel in this region and how populated it is. Our border crossing process is the simplest and quickest so far and as usual, is documented in our visas section. The good road continues up to the power station at Hongsa, which is still under construction but looks to be well on the way to completion in 2015. This is 80% Thai owned and will export 1500 MW of its 1878 MW capacity to Thailand. Local currency, always a problem when you first cross any border and is resolved with an ATM, but with a 8% withdrawal fee! We are still not sure if the exchange rate is 3,000 or 30,000 to the US dollar, turns out to be about 7,000 – so much for guesstimating. The road now splits and we have a choice of 4a or 4b: 4b is more direct, but we have heard bad reports from expats and locals so 4a it is. 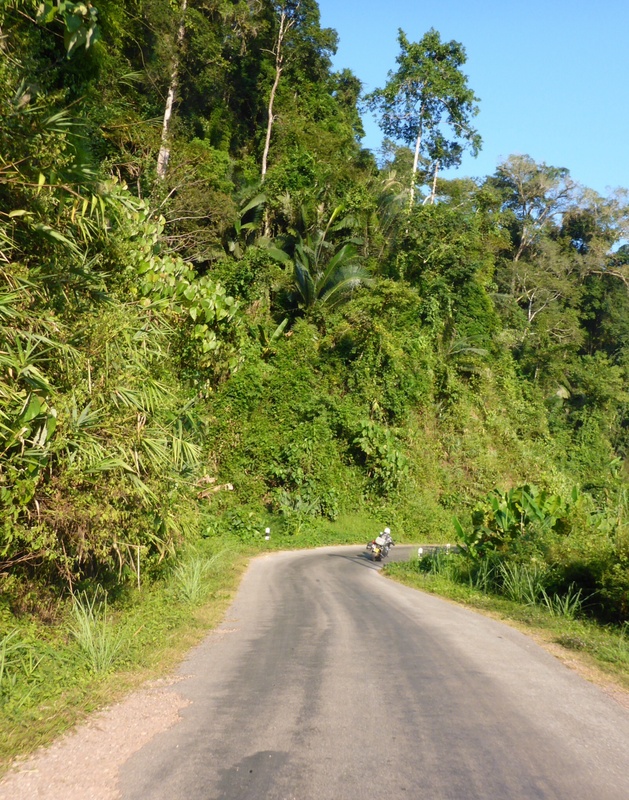 The road is narrow and has many short sections of compressed dirt or gravel, mostly on sharp or hair pin bends but apart from the occasional scare on gravel going down hill, we are ok. The roads are steep in places with quite a few 15% slopes to negotiate! We enjoy the ride and the views but are glad to arrive at our destination of Sayaboury, Sayabouly or Xaignabouli depending on which map or road sign you look at, before dusk. The people here do not seem to be able to pronounce ‘R’ hence the different spellings. 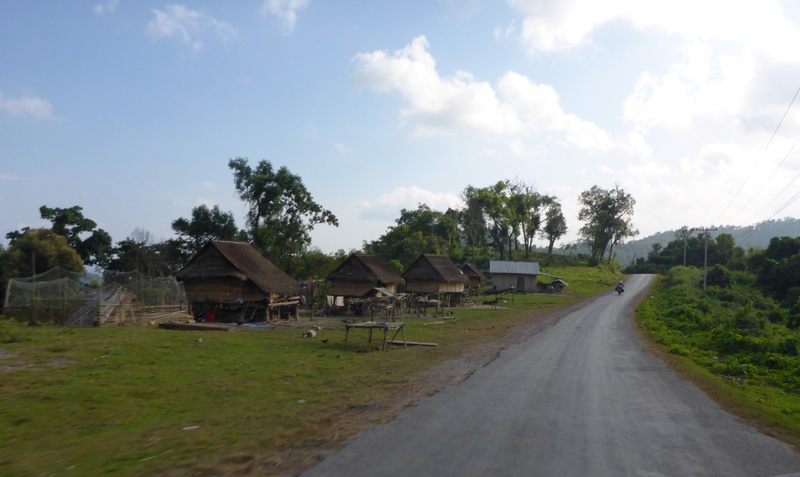 We find a clean and very cheap guesthouse and, with no tv or internet, get an early night. 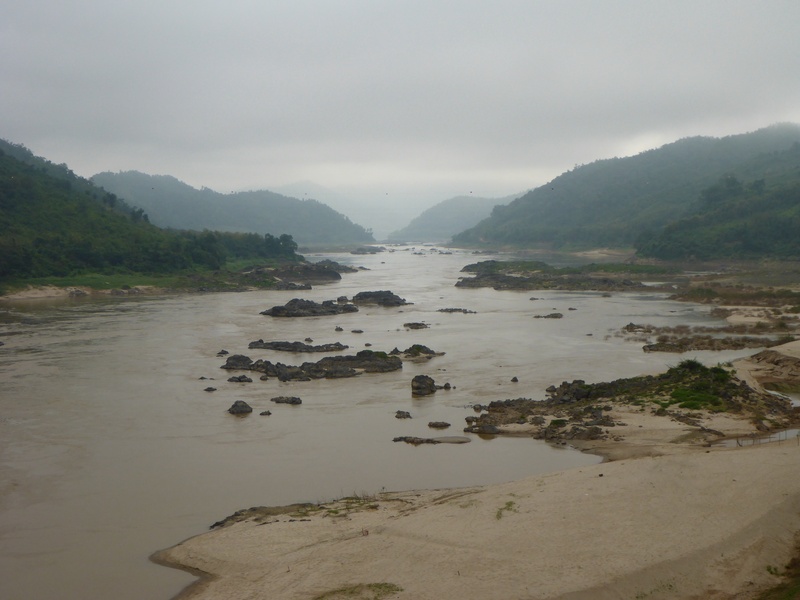 We only have 100km to travel today to Luang Prabang, which is a tourist destination on the banks of the Mekong river. 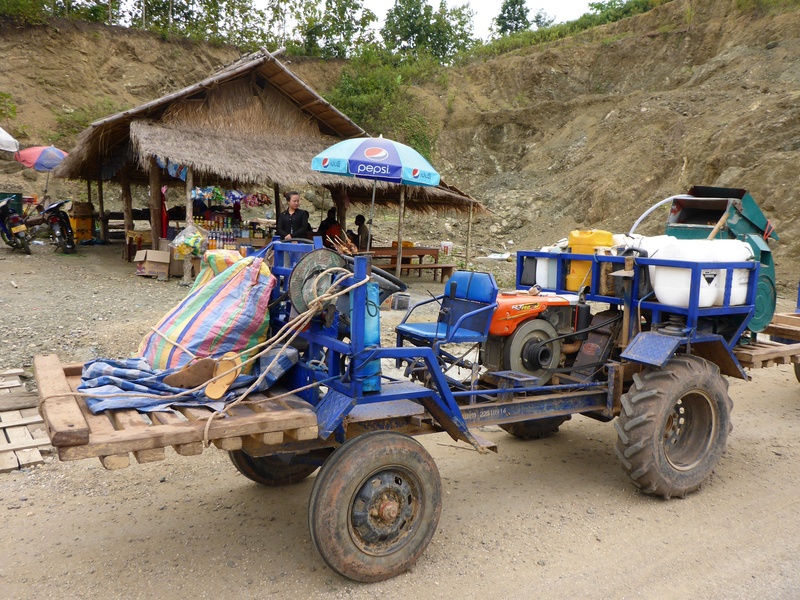 We are looking forward to crossing the Mekong river by ferry, but when we arrive, a new concrete bridge spams the river. We stop for breakfast and have to decide between small roasted animals that look like frogs or fish. A close call but the fish wins, and rewards us with dozens of bones. As we sit, an old Russian cab-less truck converted for logging trundles by. I had seen it earlier and wondered how it worked and where it was going. Should we follow it and see? This journey is a bit like Alice in Wonderland, having followed the white rabbit down the rabbit hole, us leaving the UK, and being each day in the long hall with many doors, none are locked and we can enter anyone without potion or cake. The outcome of each daily decision, such as to follow the Russian truck or not will have consequences in experience, time etc. if we had opened every door we saw we would probably be still in Europe after five months, not practical when our insurance finishes on the 26 December. There is no specific way to undertake a trip like this and for all we may have potentially missed, it is more than compensated by the experiences we have had across 18 countries to date. 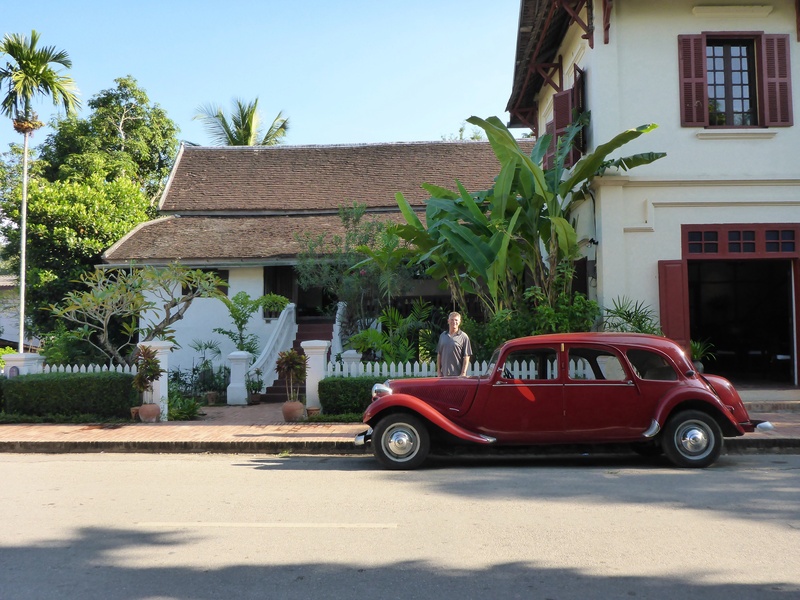 Anne has identified an old French hotel in Luang Prabang.. We ride up and are greeted with cool drinks and towels in a huge lobby. They promise to get give us a good price and come back with a 10% discount on the standard room rate of 560. I ask what currency and am told US dollars, but does include breakfast, eek! We quickly refold the cool towels and beat a hasty retreat. Not quite, they are helpful with hotels more in our budget range including backpackers when he knows how much we are willing to spend! 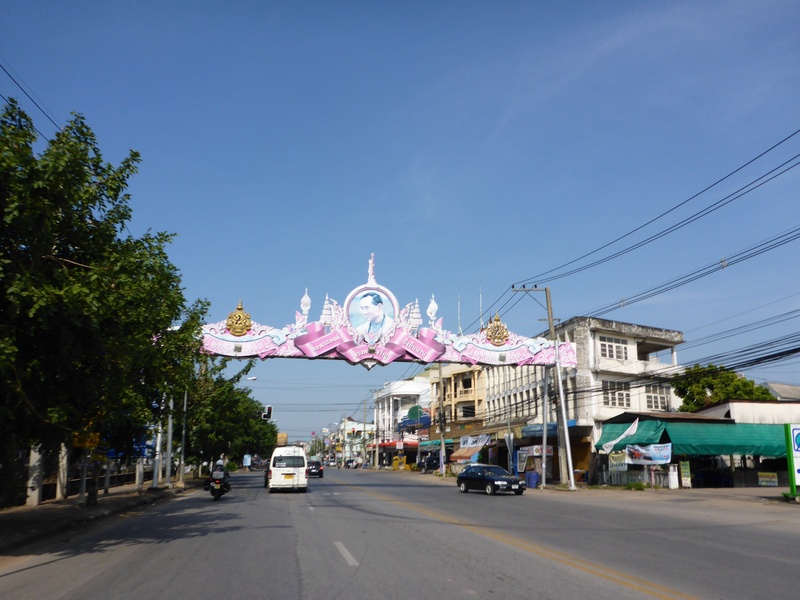 As this is a small town, very popular with tourists and high season, accommodation prices are not comparable with Thailand. We reach town and start to see so many tourists, but that said it has a good feel and unlike many places, you are not pestered with hawkers and touts. We end up at the 3Nagas Hotel which has a great feel and central location. Food here is excellent and the availability of good coffee and French croissants add to the pleasure. 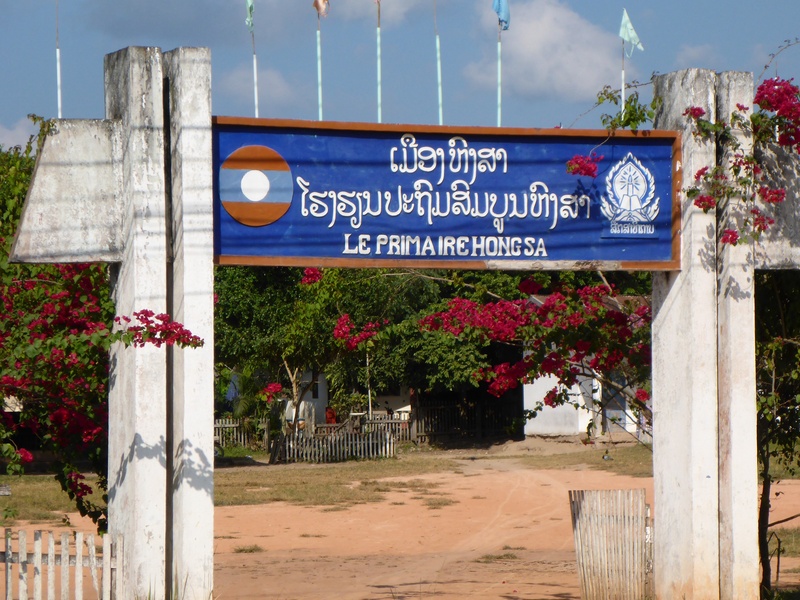 We will stay three nights and explore the town and surrounds and enjoy the excellent less spicy (hot) food. to continue. 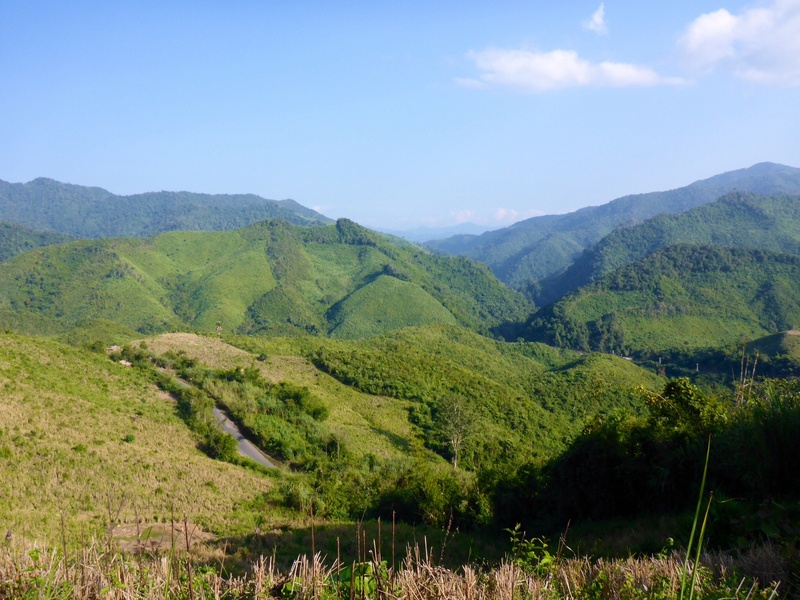 Ah Thailand, we have fond memories of our stay in Khao Sok NP last year. 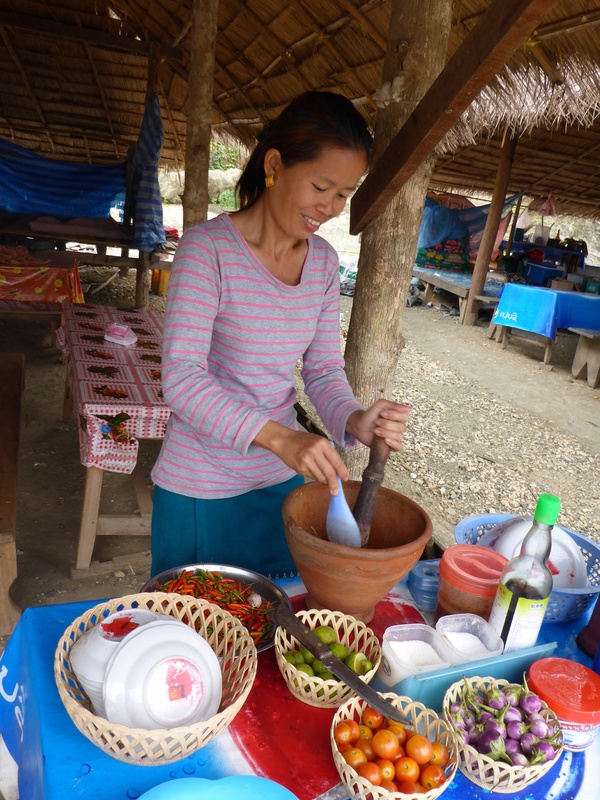 The people, the food (at very cheap prices), all good! 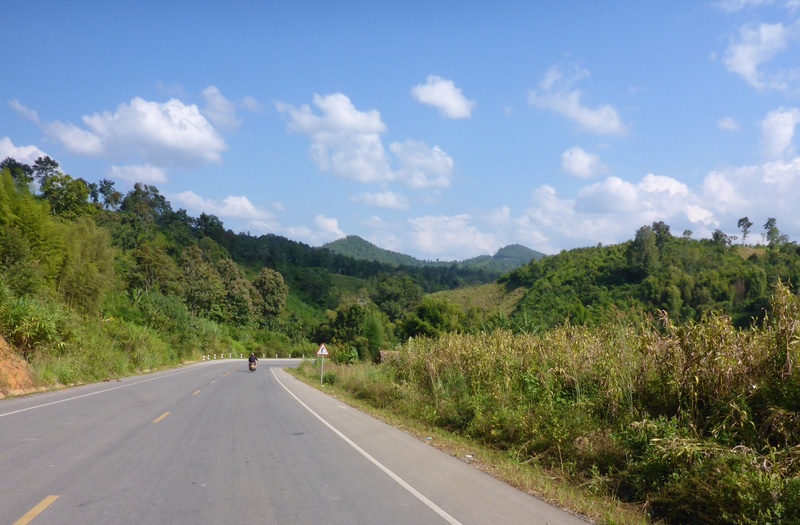 Enjoy Laos and continue to tell us all about it! Thank you, we are recharged on heading for home, via a few countries yet. 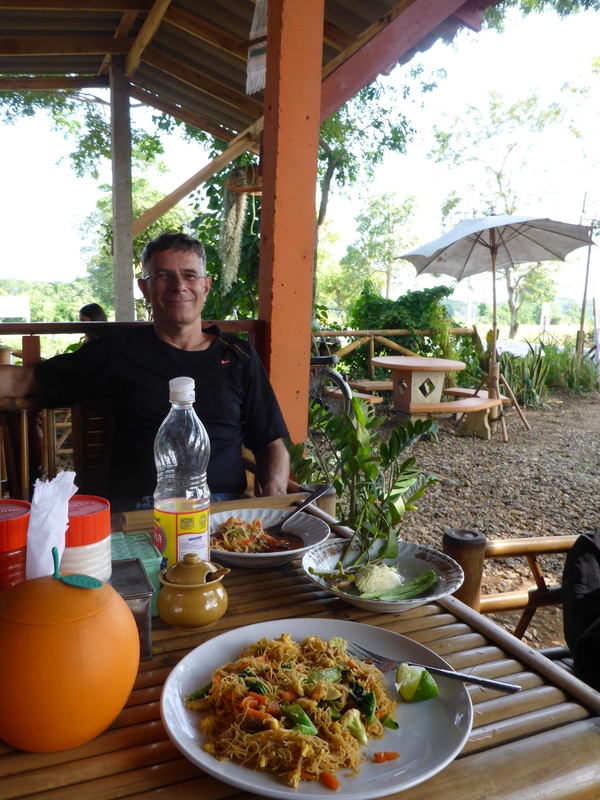 We are enjoying Laos but have found the cost of living quite a bit higher than Thailand. Hope the move went smoothly and see you both next month if your are around. Thank you, I knew that English literature at school would come in useful one day. You are correct, a 1950 model. More photos to follow in the next post. Anne uses a gadget called a ‘hand’ while riding for most photos. It comes with four fingers and a thumb which can be manually controlled to undertake functions such as zoom, take picture etc. both the hand and camera are attached to the rider, the camera is detachable, the hand appears not to be. Breakfast is still western, will be interesting to see what we think of local Indian and Thai food when we return.